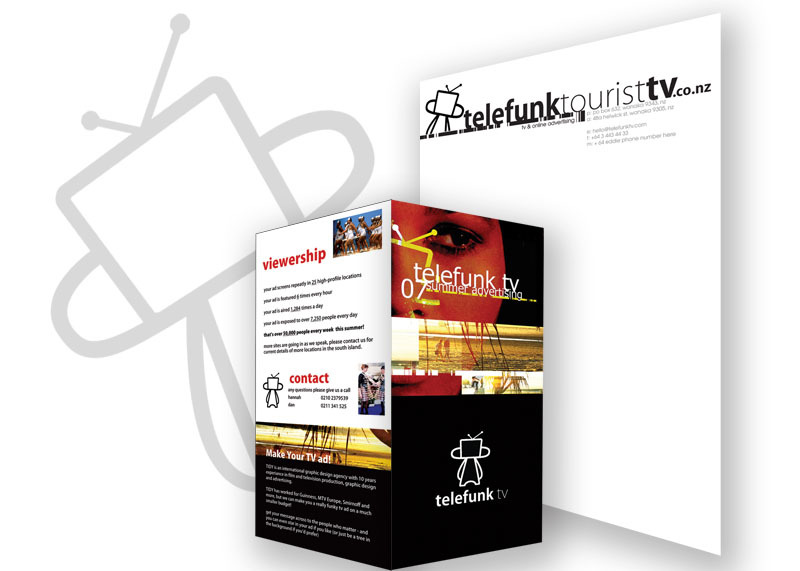 Before Dan was in the thick of it with Future Creative and Tidy Design, his previous business was Telefunk TV. This was a network of TV’s placed around the South Island of NZ displaying advertising that promoted local tourism operators. The audience was made up of independent travellers and backpackers so the logo had to be youthful, colourful, vibrant and full of persona. To best express this Dan created and animated the character of telefunk to reflect all those traits. Promotional material included design of business cards, brochures, posters, logo animations and TV commercials. All these were fun and full of life and appealed to advertisers and travellers alike. Dan purchased the network from BTV in 2005, re-branded to Telefunk TV and expanded the network before selling it in 2009 to purchase an offset print franchise.